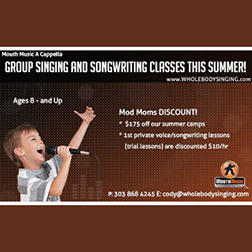 Whole Body Singing Mouth Music Summer Camp - Get Involved. Make Friends. Enjoy Motherhood. The Intention of the Whole Body Singing Studio is to help any level of singer access their fullest potential. This includes the full potential of their voice, musicianship, and performing artist within. Thank you to Cody Qualls for providing the beautiful music for our 2014 Holiday party!